One week ago Japan was shaken by a terrifying earthquake that rocked the islands. 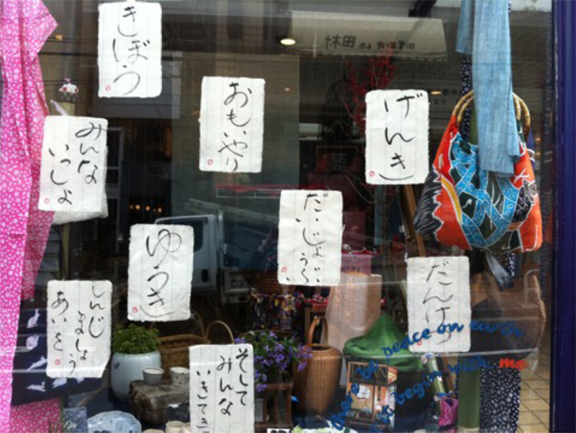 In Tokyo the earth trembled endlessly, shaking houses and buildings and trees. In Fukushima, Miyagi and Sendai, the quake followed by a crippling tsunami, was far worse and nuclear power stations, homes, cars, power lines were destroyed. Thousands of people were lost. More than 20,000 people were missing or killed, or presumed lost in the greatest earthquake Japan has ever experienced. Blue & White suffered minimal disruption, but our hearts go out to the victims of the earthquake and subsequent tsunami and nuclear catastrophe. 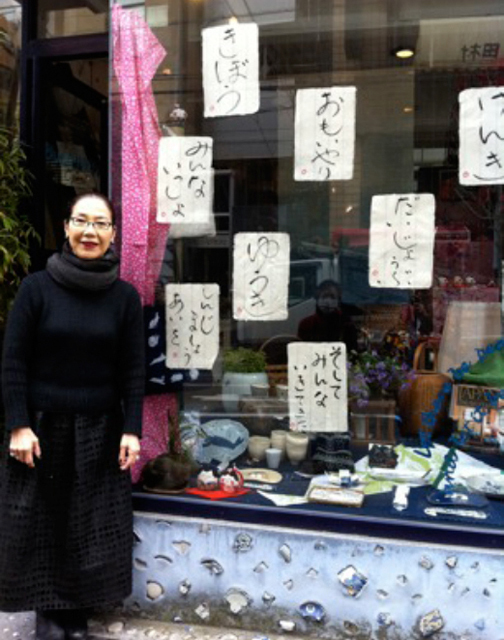 Our irrepressible manager, Sayoko Hayasawa, immediately started to brush a series of calligraphy messages in the Blue & White window to encourage passersby in the neighborhood. They saw her words of reassurance and nodded or smiled or shed a tear. Some came in to add their own message to give courage and a fighting spirit to people on the way to the next door market where supplies were depleted and milk and bread had run out. All languages were welcome. People were helping people in times of crisis. Blue & White conveyed the message. The gentle spirit of cooperation and togetherness in the neighborhood were remarkable. Strangers were speaking to strangers, people were helping each other in an hour of mutual anguish. We were none of us alone. Neighborhoods stood together, bread was shared, lights were dimmed to save energy, people banded together, helping each other, giving courage.